The First World War defeat of his country lit a fire in Adolf Hitler: “In these nights hatred grew in me, hatred for those responsible for this deed…Miserable and degenerate criminals!” In March 1920 Hitler became active in the German Workers’ Party. On 11 July 1921 he resigned from the party knowing that his popularity meant it would collapse without him. When he was asked to return, he agreed but on condition that he was in charge. On 29 July 1921 Hitler was introduced as Fiihrer of the National Socialist Party and he changed the name of the party to the National Socialist German Workers’ Party. 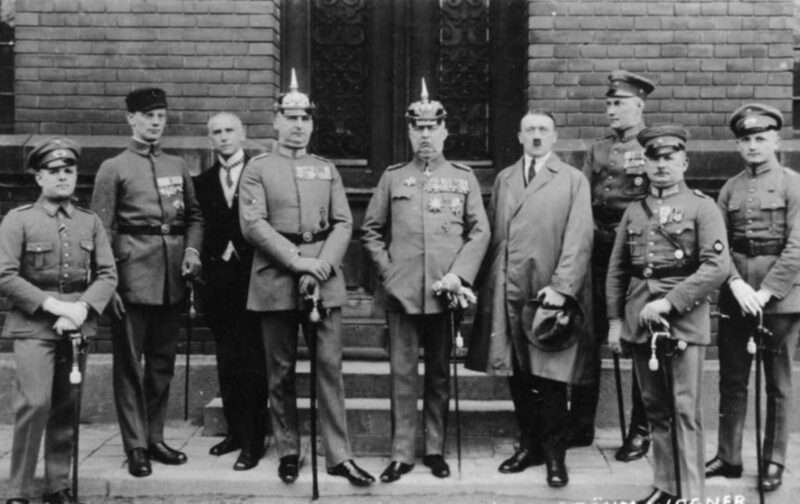 Hitler took von Kahr and other dignitaries into a side room and told them that he and the war hero General Erich Ludendorff would form a new administration. By early the next morning, Hitler began to realize that his plot may not be successful. At 11am, with Ludendorff, Herman Goering and Julius Streicher, he began a demonstration moving towards the centre of Munich. When the 3,000 protesters reached their destination at 12.20pm, 100 armed policemen met them. Hitler ordered the police to lay down their weapons. They responded by opening fire. In seconds, 16 Nazis and three policemen were dead. Goering was shot in the thigh and Hitler fled in a car. Three days later, Hitler was arrested and charged with treason. On 26 February 1924, the trial opened at the Infantry Officers’ School in Munich. Virtually all the judges had sympathy for Hitler and the other ten defendants. By the time closing arguments were made on 27 March millions of Germans supported Hitler. The verdict was delivered on 1 April 1924. Ludendorff, unsurprisingly, was acquitted but the others were found guilty. Hitler was sentenced to five years in prison, with the possibility of parole after six months.